Generates a .jsx that must be run from AfterFX>File>Run script. Creates appropriately sized comp and layers. 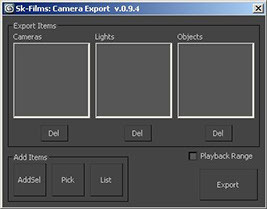 Exports: Cameras, lights, and planes as AfterFX objects. All others as nulls. Export size based on smallest HD screen/projector. Optional manual scaling. Update 3.0.0: added support for Physical Cameras, Arnold Lights, 2k and 4k projectors.